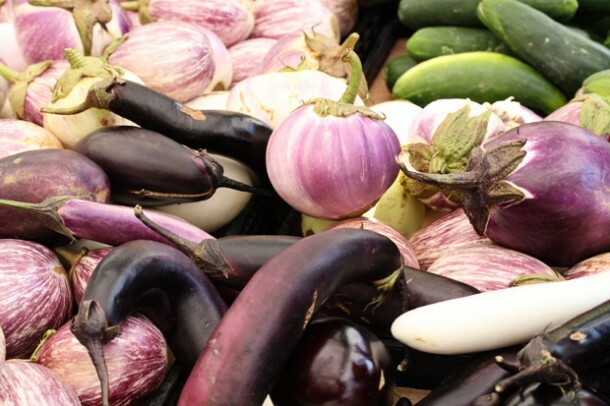 Eggplant, like zucchini, is part of the late summer farmer’s market bounty. It’s high in fiber and rich in several antioxidants that reside in the peel (include nasunin, a purple anthocyanin high in Vitamin B1), plus high in copper. So what are some tasty ways to cook with it? plenty of eggplant from my Granny’s garden, I’ve learned over the years how to achieve that soft, well-cooked texture without overdoing it with oil or loads of breading. Try your hand at these two, super simple techniques that you can dress with a multitude of savory sauces! 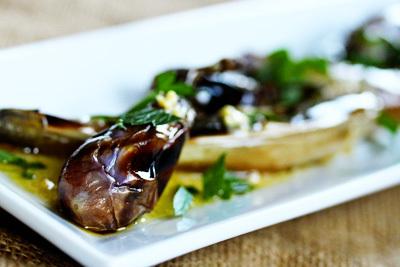 Step #1: Slice your eggplant into 1/2-inch thick slices and sprinkle with salt. Step #2: Lightly brush both sides of the eggplant slices with olive oil or coconut oil instead of soaking in an oily marinade. Step #3: Grill 5 to 6 minutes, turning often until soft. Step #2: Coat a large skillet with cooking spray and place over high heat. 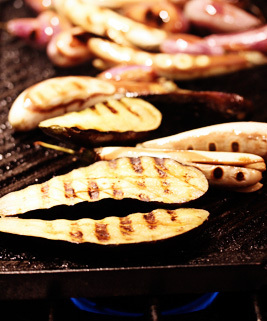 Add a few slices of eggplant in a single layer. Reduce the heat to medium and cover with a lid. Cook 2 to 3 minutes until the eggplant browns. Step #3: Coat the tops of the eggplant slices with another layer of cooking spray and flip. Cover and brown 2 to 3 minutes more. Step #4: If the eggplant isn’t tender yet, carefully add a few tablespoons of water, cover and steam through 1 minutes more until tender. Drizzle a few teaspoons of olive oil and top with fresh herbs and serve. 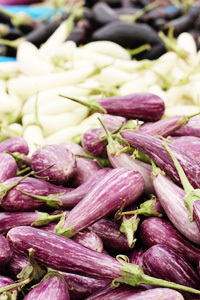 Eggplant has a naturally rich, almost smoky flavor to it that pairs well with sweet and sour flavors you’ll find in both Asian and Italian cooking. Are you fan of miso soup from your local sushi shop? Then you’ll love this easy-to-make miso dressing: Start with flavorful miso (that resembles peanut butter) that you’ll find in the refrigerator isle of your local health food store. For 1 pound of cooked eggplant, whisk 2 tablespoons miso paste with 1 tablespoon rice vinegar, 1 minced clove garlic, 1 tablespoon minced ginger, 1 tablespoon olive oil, and pinch of sugar. In a blender, place 2 medium carrots (peeled, grated), 3 tablespoons sesame oil, 2-inch piece of chopped ginger, 3 tablespoons white vinegar, 1 minced garlic clove, 1 tablespoon low-sodium soy sauce, 1 tablespoon honey, 1/4 cup water. Blend until smooth. Adjust the consistency with additional water as necessary. Drizzle over cooked eggplant. Place cooked eggplant on a baking sheet and top with 1 cup of your favorite jarred marinara and 1 cup grated mozzarella. Place in a preheated 400°F oven for 10 minutes until cheese is melted and begins to brown. Mash 2 minced garlic cloves, and 1/4 cup finely chopped parsley into 4 tablespoons of softened butter. Spread over warm cooked eggplant and serve.